Following a series of recent improvements, parking spaces at both our hospitals are now easily available at most times of the day. The biggest improvement has been at St Peter’s, where our new barrier system (in outpatients and Abbey Wing) has virtually eliminated the need to queue for spaces. This means we are no longer asking our patients to arrive early for their appointment in order to find a parking space, and everyone is telling us how much they value this significant improvement. Disabled parking within our barriered car parking at St Peter's is chargeable (see rates below). 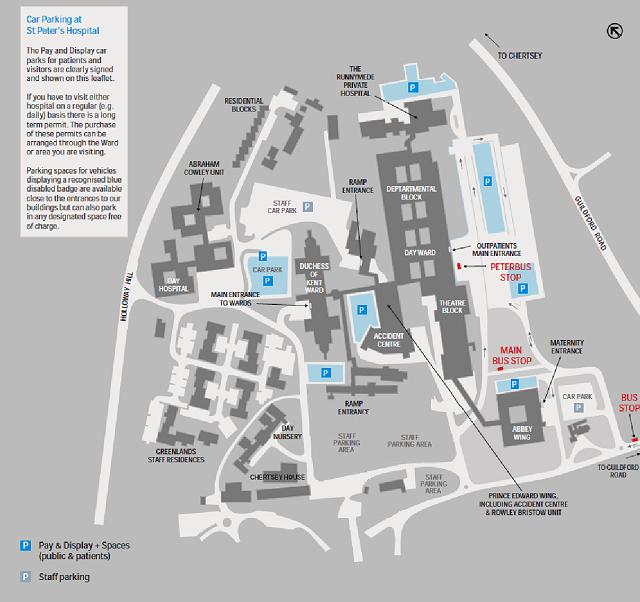 We have disabled spaces located at the side of Abbey Wing, opposite A&E, adjacent to the Stephanie Marks Centre and in our pay and display car park at the rear of the hospital close to our wards in the Duchess of Kent Wing. For more information on disabled parking, see below. For any parking queries please contact our Travel Plan Office on: 01932 723675. As described above, we have a number of disabled parking spaces spread across our hospital sites. At St Peter’s there are automatic opening doors on Levels 1 and 2 of the Outpatient Department, at the entrance to the Duchess of Kent Wing and the entrance to Abbey Wing. At Ashford there are ramps at both the Main Entrance and the Outpatient Department entrances. Both sites have easy access to lifts. Patients who are claiming any of the benefits shown below are entitled to claim back their parking costs. This can be done at the main reception desk at both hospitals on production of the appointment letter and proof of eligibility. All of the above include children up to the age of 20 years. Children of 16 or 17 of age in care.